An Air Force contract to build an obsolete B-2 refueling tanker has suddenly become a campaign issue--and the Democrats are on the wrong side. 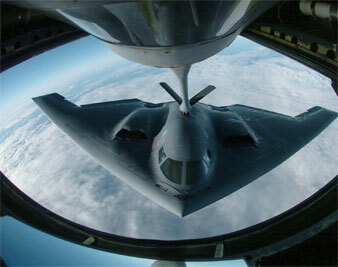 AP Images Refueling a B-2 bomber. Remember Curtis LeMay, the Air Force general played to chilling effect by Sterling Hayden in the 1964 movie Dr. Strangelove? If you’re too young for that reference, you probably don’t recall when the concept of Mutual Assured Destruction (MAD) dominated our military posture toward our Soviet enemy. I bring this up because the midair refueling tanker that the MAD warrior LeMay commissioned suddenly has become a controversy in the presidential campaign. MAD was based on a triad of air, land and sea forces that would punish a Soviet first strike, ending all semblance of life on the one-sixth of the planet that composed the old Soviet Union. Toward that end, we needed not only thousands of land-based weapons but thousands of other weapons on ships and on airplanes. It was LeMay’s insistence that nuclear-armed bombers be in the air 24/7 that gave rise to the midair refueling tankers that were in the news this past week. Controversy arose when the Government Accountability Office questioned an Air Force decision to award the contract for a new generation of those “gas stations in the sky” to one defense contractor instead of its rival. Neither newspaper indicated why we needed $100 billion in tankers, other than in a revealing photo in the Times showing one of the airplanes refueling a B-2 bomber, which brings us back to Gen. LeMay and his MAD doctrine. The B-2 was designed to be the modern bomber in the triad confronting the Soviets. Its very expensive stealth cover would be able to penetrate a sophisticated Soviet radar system–which was never built. That also assumes that the B-2’s stealthy cover would stop deteriorating in the rain, as it was wont to do, but the test for this technology never occurred because of the untimely fall of the Soviet menace. Despite having lost its purpose, production of the B-2 continued for a while as a jobs and profit program supported by key legislators from both parties, as has been the case with the tanker designed to fuel the planes. Woe to the legislator who dares take on any weapons program, and that is why John McCain has become the subject of criticism from the Democrats. In one of his better performances as a senator, McCain distinguished himself by challenging a swindle that would have rewarded the Boeing company with a contract worth $100 billion for leasing Boeing aircraft that were converted to refueling tankers from a model that was not selling in a depressed market. Thanks to McCain’s insistence on a criminal investigation, the chief financial officer of Boeing and the top procurement officer in the Air Force wing of the Pentagon were sent to serve time in federal prison. The contract was canceled, and a new contract was awarded to Northrop Grumman and a European partner. The Democratic National Committee now has criticized McCain for having opposed the Boeing deal, charging that McCain had “sent American jobs abroad.” The DNC’s attack on McCain speaks volumes to the bipartisan gut-checking in favor of military waste that has led us to squander trillions of taxpayer dollars since 9/11. Now, of course, McCain has done his bit to waste egregious amounts of taxpayer money by cheerleading for an Iraq War that has already burdened us with trillions in future debt, but that hardly exonerated the Democrats in once again attempting to one-up the Republicans in throwing money at defense contractors.